The Moo Doe line has come down over the centuries and all true Oom Yung Doe practitioners proudly stay on the original Moo Doe line. Traditional Moo Doe recommendation and testing guidelines are strictly followed. In the U.S. there are many self-proclaimed expert martial artists who make statements about how good they are, but only a small number can demonstrate what they claim. The real value of what a capable martial artist can teach should be easily recognizable through a demonstration of their movements. 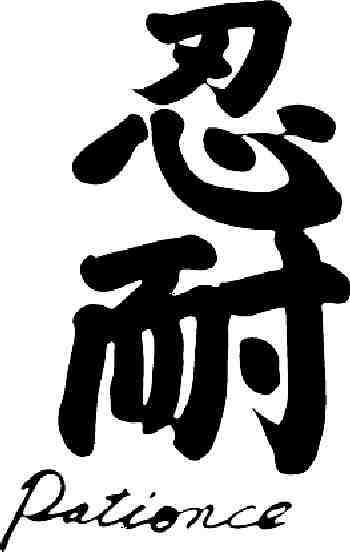 The traditional Chung Doe (Oom Yung Doe) line of martial arts has a clear system of rank and position. Ranks from 1st degree through 10th degree are recognizable by belt, uniform, insignia, rank certificate and current I.D. Positions from assistant instructor through Grandmaster are recognizable by uniform, insignia, position certificate and current I.D. Capabilities of rank are demonstrated through movement. Capabilities of each member’s position are shown through certification of their judging skill and ability to teach. 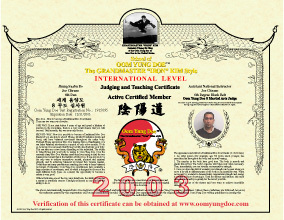 The Chung Doe (Oom Yung Doe) rank and position system (1st degree through 9th degree and Assistant instructor through National Instructor) ensures that all students receive complete training to become fully certified and qualified teachers enabling them to pass down the traditional Moo Doe knowledge to the lower rank practitioners. This system is unique in the United States to the Oom Yung Doe line of martial arts. Only the Oom Yung Doe line uses the traditional six-section system up to first degree and clearly demonstrates the line of knowledge all the way up to Grandmaster. Other martial arts schools may imitate this system but it is easy to see the lack of authenticity in the absence of the Oom Yung Doe Rank and Position and Judging and Teaching certificates. Only instructors with a current Rank and Position certificate and a current Judging and Teaching Certificate are recognized by Grandmaster “Iron” Kim to be in compliance with the rigorous standards of the Chung Doe (Oom Yung Doe) line of knowledge. Combining over one quarter of a century of learning, a core group of higher degree (8th and above) National Instructors, have come together practicing true Moo Doe principle in training. Each of these have been witness to and received personal instruction from Grandmaster “Iron” Kim. Maintaining outstanding form, this select group of teachers have formed for the specific purpose of keeping with traditional training as is the Chung Doe (correct way). 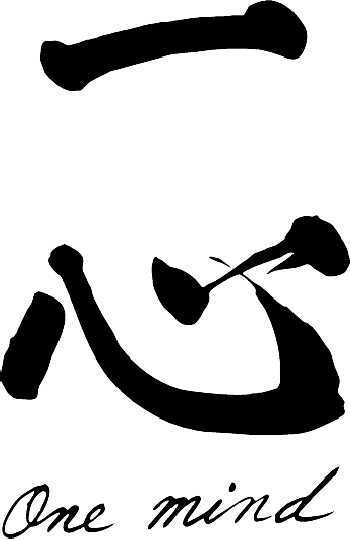 The Chung Doe (Oom Yung Doe) line of martial arts is recognized internationally. Any traditional Moo Doe practitioner can easily see the difference between traditional Moo Doe and fabricated or experimental movement. Pa Doe teachers don’t realize how much experimental movement can effect others and cause a body imbalance. That is one reason, over the centuries, the well rounded and balanced movement of traditional Moo Doe has been passed down. Today some practitioners of martial arts equate the balance, health and strength of an individual to the figure and shape of their body. Throughout history, one unique aspect of the Moo Doe practitioner has been that the size and shape of their body can be deceiving in regards to their overall health and internal power. A better gauge than their figure and shape is the strength, coordination, flexibility, speed and power that is demonstrated in the skill level of their movement. A person with an unbalanced body, regardless of their figure or shape will have difficulty performing the correct movements. There are splinter groups that unfortunately are teaching “fabricated” movement. These Pa Doe instructors are not in keeping with centuries of proven success. They may have been near the Grandmaster, but they did not receive instruction from him. They do not hold current certification of rank and position or current standing in judging and teaching. Their education and training is not ongoing. They are not recognized by Grandmaster “Iron” Kim. It is foolish to believe in these individuals, who depart from the traditional and resort to fabrication. History has proven that it is common for someone to use the good reputation of a Master or Grandmaster to enhance his or her own reputation. Use your common sense as to what you hear and whom you heard it from. Determine their reputation and their mental and physical abilities. Watch their demonstrations and then make your own decision. Each individual must live with the outcome of their decisions, because Moo Doe is directly connected with your mind and body. In following traditional Moo Doe lineage and in order to preserve it’s prosperity, it is very important to recognize the different types of instructors. In order to achieve advanced positions, it is imperative for the instructor to maintain a Chung level of character. Chung: Keeps true to Moo Doe discipline of helping others, staying with traditional values and leaving good seeds for those who follow down the Chung Doe path. Jhoong: Two types (explained here) at this level. 1. Tries to stay on the Chung Doe pathway with Moo Doe values, occasionally wanders from them, but returns. 2. An individual who does their best to follow Moo Doe values but has no choice but to discontinue their training and involvement due to personal reasons (i.e. relocating, family problems, illness). Upon returning to continue training and involvement, they are evaluated as to their credibility. Ha: Wears the face of one following the true path, while looking for personal benefit to satisfy their own greed, thus devaluing true Moo Doe moral and discipline. Without changing their character, these instructors will fail. These instructors can carry on their rank and position, while trying to rebuild their understanding of true Moo Doe value. Their position is in question and they do not hold a current Judging and Teaching certificate. Pa: Total disregard for the meaning of Chung Doe. Swayed by rumor, gossip and misjudgments. These individuals are following the Pa Doe path. These instructors are not recognized by traditional Moo Doe and are damaging the martial arts image in the public’s eye leaving behind bad seeds. An older person (for example, age 70) looks much younger, has smoother skin throughout the body and a prouder bearing. The muscles in the body have a good shape, but muscle development is internal. The body is smoother and elastic like rubber. The body’s muscles will bulge only when necessary. Then, immediately, you can visually see the tremendous strength. When you have the skill of a master, your strength can visually move to different parts of the body in an extraordinary way. When movement by a master is demonstrated, supernatural strength and energy is evident to those observing. You clearly feel that the mind and body are spiritually as one. Improperly use Chung Doe uniforms. Determine the style and history of the Chung Doe line they claim to teach. What Master or Grandmaster did they learn from? Where was he located? What special techniques did he teach? Evidence of when and how the instructor was tested, such as photos, current certification and certificates. How long did the instructor train under a Master or Grandmaster and are they still receiving training? Do they have recent group photos? Request that the instructor demonstrate and fully explain the movements. A qualified instructor should have full control. Remember, only knowledge that is correct is worth learning. To see an instructors ability is truth. To only hear his claims is like an idle breeze. It has no value. Your life here does not last forever. You can borrow knowledge, you cannot borrow another body. Think on this because it is foolish to place yourself into an experiment. Schools are not for this misuse and abuse. 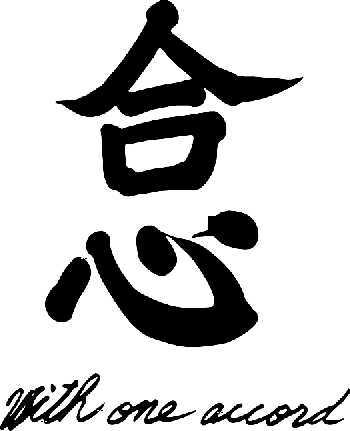 Centuries of success have proven that only true moo doe principle of practice is the Chung Doe (right path) of the life winning way.